Signed in block to print l.r., incised "MP". Signed l.r. beneath blockmark, pencil "Margaret Preston". Not dated. 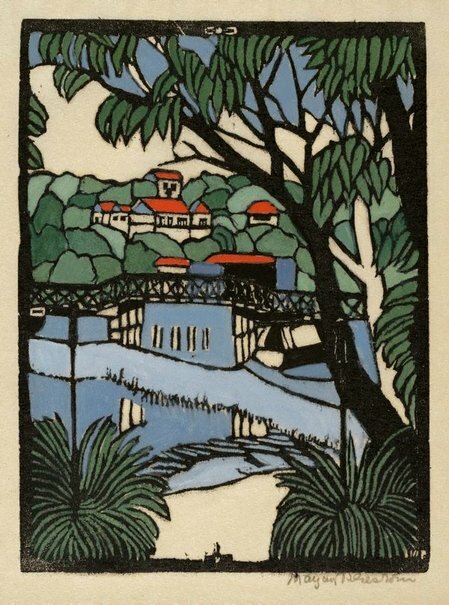 A survey of Australian relief prints 1900/1950 , Armadale, 1978, 21 (illus.). Helen Campbell, Colour, rhythm, design: wood & lino cuts of the 20s & 30s , 'Introduction', pg. 2, Sydney, 2010, 7 (colour illus.). Helen Campbell, Look , 'Colour, rhythm and design: Wood and lino cuts from a time of great creative vitality', pg. 13-15, Sydney, Feb 2010, 13 (colour illus. ), 14. Margaret Preston , 'Transitions 1920s', pg. 61-150, Sydney, 2005, 82 (colour illus. ), 260. Denise Mimmocchi, Sydney moderns: art for a new world , 'Making Sydney modern: the artistic shaping of the postwar city', pg. 67-85, Sydney, 2013, 74, 162 (colour illus. ), 315, 323.